This is one of those encounters where certain classes are essential to have in order to beat it. I’ve expressed my dissatisfaction with this design in the Firebrand and Stormcaller encounter where a Marauder/Sentinel with ‘bloodlust’ is required in order to beat the enrage timer. For the Kephess encounter, classes with short interrupt cooldowns MUST be brought to the fight in just to make it past the first phase. 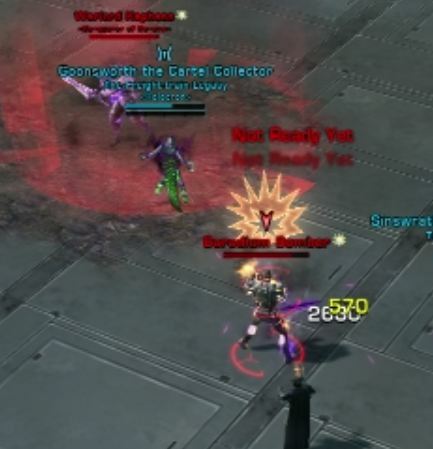 The Imperial Siege Droid have a cast called Calibrating Shot that must be interrupted, otherwise it will place a stacking damage buff and defensive buff for each time it is missed. Everyone needs to take part in the interrupts, including the healers. Missing one is okay, missing two won’t kill you, missing three can cause some trouble, but missing four or more will cause your timing to be off and you may end up wiping. The casts are approximately 6 to 7 seconds apart so you will need to bring a couple of classes that have multiple interrupts such as a Marauder/Sentinel or one with a fast cooldown such as a Powertech/Vanguard spec’d into the Advanced Prototype tree. Assign the interrupts ahead of time and make sure everyone knows their rotation. To avoid the groups being caught in saturation fire you will need to destroy the middle droid first, the furthest droid second and the near one last. Once they are destroyed a Baradium Bomber will appear. Burn it down quickly as in SM and HM and put some hurt onto the Walker. Try to take it down by a third of its HP (~67%) or better before going into phase 2. I don’t know what diabolical mind came up with the mechanics for this phase, but I want to simultaneously commend them and punch them in the face… in a loving way, of course. This is the wall that most groups are stuck on and it is not without good reason. The major change for this phase is that you now have two Trandoshan Warriors with shields to contend with. That may sound easy, but both the Warriors and the Trenchcutters that come along with the group hit the tank a lot harder. They also spawn quite a bit faster so your DPS must be on point and burn through the Warriors before AoEing down the rest. Top Tip: If you are tab-targeting through the different mobs and you accidentally pass the mob you were looking for you can hit Shift-Tab to go back to your previous target. There are three of these groups to contend with and, undoubtedly, you have seen some of the various methods used to make it through this phase. 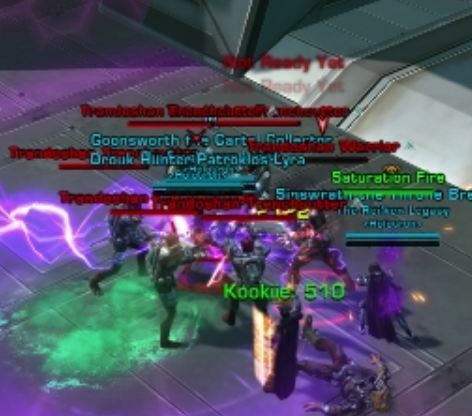 Some guilds prefer to have a tank kite the Trenchcutters while the other peels Warriors off before meeting in the center to AoE them all down. Others use the ‘safe spot’ behind the walker and fight through the Trandoshan mobs there to avoid being hit by Saturation Fire. Different groups will have different methods of dealing with this phase and so you will have to find one that works best with your group. As the last Trandoshan dies another Baradium Bomber will appear. By now you should know the drill: Kill it, take down the walker and DPS it until the Pulsar Droids appear for Phase 3. Fortunately, there isn’t much change for this phase. Stack on top of the droid that is not casting Channeled Pulse with the exception of one tank to take rail shot hits. Alternate back and forth until both are destroyed. The droids have more hit points in Nightmare Mode than on Hard Mode so hopefully your DPS is up to par. 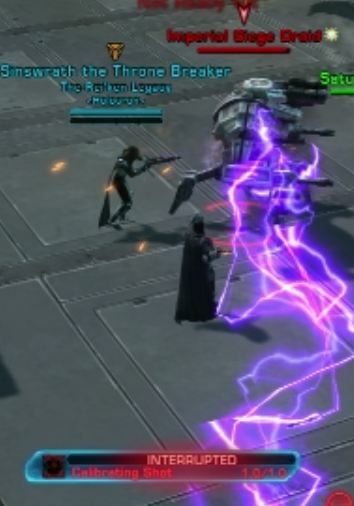 Top Tip: During the Walker burn portion of the previous phase, have your Healers and ranged DPS stand where the Pulsar Droids will land so that they can maximize their DPS and Heals. As the final Pulsar Droid falls, Kephess will jump out of his Walker and land on the ground. A tank will need to pick him up immediately while the DPS starts to unload onto him. In Story and Hard modes you had plenty if time to kill Kephess after the Walker was destroyed. In Nightmare mode, his enrage timer begins as soon as he hits the ground so get DPS on him as soon and as often as possible. While Kephess is wailing on the tank, a Baradium Bomber will appear as usual. Kill it quickly and make certain that you destroy the Walker. 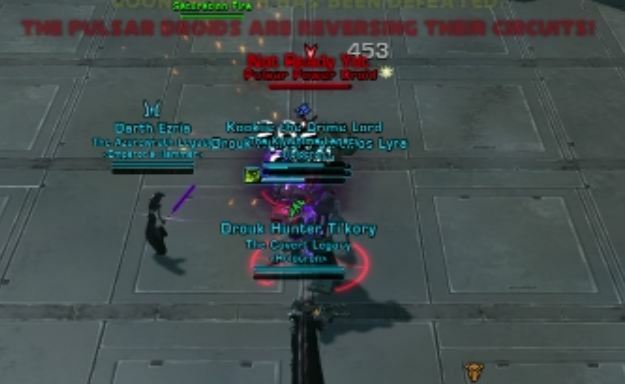 Due to enrage timers, you will not have time to use a second Baradium Bomber to bring the Walker down. As in Hard Mode, Kephess will begin to put a bleed effect on the tank which will necessitate tank swaps and intensive healing while the DPS bring him down to the 60% mark. From there he will cast Gift of the Masters and behave as he does in Hard Mode with one exception. Kephess has a new trick up his sleeve. When you reach the phase where tanks are dropping purple circles from the Breath of the Masters cast, Kephess will pull the tank to him after they drop the second circle. The tanks will need to be ready for this by moving in opposite directions to allow the tank affected by Breath room to drop circles while the melee DPS has a place to stand and do their job. Assassin/Shadow tanks are ideally suited for this phase since they have a Force Spring ability to get them out quickly. We’ve logged about 15 hours on this encounter alone and we’re still working on getting to phase 4 cleanly. Phase 2 still gives us the most trouble and finding the right strategy for our ops composition was challenging. We now have a plan of attack and hope to have him down soon. This fight is, by far, the most difficult and frustrating encounters in the game and I am loving every minute. I hope you guys are as well and hopefully this guide will offer some ideas as to how to approach the encounter.